Hi I'm Tory Favro and welcome to the Jackass the Movie review. For those of you unfamiliar with the work of presenter Johnny Knoxville and co., Jackass is the MTV series featuring all sorts of crazy stunts and antics from the team. A bit of trivia; one of the members of Jackass, Bam Margera first made the video CKY with his friends Ryan Dunn and a bunch of others that made them the perfect partners in crime for the Jackass gang. After three seasons of craziness, the team needed to be able to raise the ante somewhat so they had no alternative but to make a movie, to include profanities and also some of the stunts planned were so out there that MTV would not allow them to be shown in the regular show. It's funny when you first start watching the movie, you are expecting a story, well forget about it. 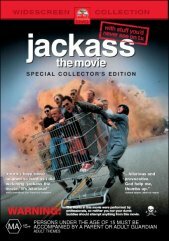 Jackass the Movie is quite simply a longer more extreme version of the television program and they readily admit that. I laughed fit to burst throughout the entire screening of this movie, from the beautifully cinematic start that really throws you off what the movie quality is going to be, to the raw footage of the actual feature itself and finally the cinematic ending that was so funny I almost choked with laughter! If you've never seen a Jackass episode then you might be in for a bit of a shock as for the most part the movie is shot with small home video cameras as many of the stunts and tricks are done in public and it wouldn't work if they had big cameras out shooting the action. The sound quality does fall along the same lines, though you can tell that it's been fixed slightly for the theatrical release. The crazy stunts aside, the extras on this disc have to be seen to be believed, making it a must have for fans of this sort of silliness. I think that folks need to have a certain mindset to really get the most out of this movie, my wife shook her head in disapproval at the very start of the movie, whereas my sister laughed to the point that she nearly fell over. Listening to the guys talking was amusing and informative and really gave you an insiders view into the movie. The nice thing is that it's just by the guys who starred in the movie so we don't get bogged down by tech talk, it's just a fun look at how it was all done. No holds are barred, right down to the point where they tell you that some of the stunts you saw during the feature were faked, such as when Ryan Dunn tries to yank the team's big guy Preston Lacy out of a couch by riding a BMX tied to Lacy. Lacy was so big that he didn't budge, so later the whole team yanked him out of the couch so that later it would be edited to appear that the bike had done it. Add to the comprehensive commentaries, a making of, an additional 27 minutes of extra features that are basically an extra episode of Jackass that couldn't fit into the feature proper for various reasons. In fact, as a package, this is an extremely comprehensive disc that provides many, many hours of viewing. This movie is sheer champagne comedy and one of my favourites for repetitive viewing as each time the absurdity of it all leaves me in stitches. For those of you who are worried about how certain stunts might have affect those who unwittingly partook of them, make sure that you do take the time to listen to the commentaries and hear how they were taken care of afterwards. This disc gets the huge two thumbs up for daring to be different and original. I got a heap of enjoyment out of it as has everyone who watched it with me. It may not be for everyone in it's entirety, but there is something in it for everyone who loves inane humour and just downright silliness.